Nothing is worse than being out at a party, realizing you need to touch up your makeup, and not having the tools for the job. That’s why the Sephora Collection Slim Essential Brush Set 1008143 is so amazing; full size brushes on travel handles that are the perfect size for any bag and any occasion. The brushes in the Slim Essential Set are all the average person needs. All five (blush, powder, large eyeshadow, small eyeshadow and lip) are made with synthetic microfiber, which is easy to clean and is gentle on sensitive skin. The real draw of this set, though, is its convenient portability – all five brushes fold up into a discrete black portfolio about seven inches long and three inches wide. Perfect for those quick date touchups and unnoticeable in even a small evening bag. 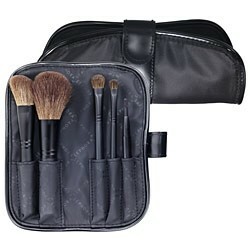 And with this Sephora professionals set, you don’t have to sacrifice quality for convenience. The brushes themselves are full-sized and high quality, allowing for easy, flawless makeup application. And though the handles have been downsized for convenience, they’re not so small as to make application awkward. Their size, in a word, is perfect! My personal experience with this brush set has mostly been very positive. The only makeup I normally wear is some very light foundation, so the powder brush is by far my most-used, but it has been fantastic. No loose hairs, no scratchy or uncomfortable application on my very sensitive skin. And the set really is a breeze to clean; just a quick whirl in shampoo and water every few weeks. I’m less pleased, however, with the small eyeshadow brush, which broke (the brush separated from the handle) about a month after I made the purchase. I never use that brush at all, so the set is still very functional for me, but I was surprised; Sephora tools are usually high quality. I also wish the portfolio had one little extra pouch for a nail file or tweezers; the Slim Essential Set is missing a few essentials. Though five brushes probably aren’t sufficient for a professional makeup artist, the professional-quality Slim Essential Set by Sephora makes everyday makeup application a breeze. And at $40.00, this set is a good (but not great) buy. For more adventurous (or picky) makeup enthusiasts, I would recommend the Sephora Makeup Artist Brush Belt Set: fifteen brushes in an awesome makeup belt. A different kind of portable for professional makeup artists. But honestly, all those brushes intimidate me. I’ll stick with my Slim Essential Brush Set.